As usual, this kit arrived very quickly and was every bit as beautiful as all of the other kits I have purchased from this company. Impecable service and quality. I am only disappointed by the fact that I am now out of wall space! 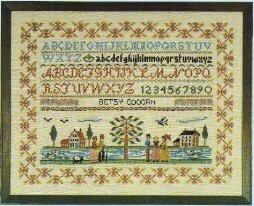 I have been ordering from Country Stitching for years. Have always been very happy with them. Quality is excellent. I've been working this and like it very much. The only problem I've encountered is that the rust and coral are very similar in color and I've had to pull out and redo a few times. But it is turning out very nicely. This is a wonderful store. I have been ordered from them for years. Great selection and great quality.